Hi everyone and welcome back to Day 2 of our Hollydays series. Today I have a fun little treat idea that's inexpensive and you can use what you have in your stash!! 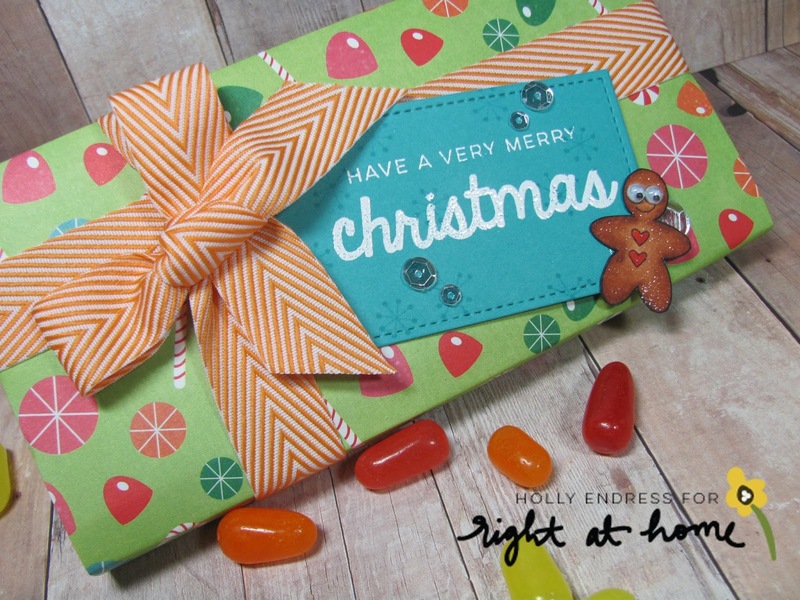 I usually wrap the large size Hershey bars that you see around this time of year and add a gift card or a Lottery ticket to them for the mail man, UPS guy etc... When you need a little extra gift on the fly. I found the Movie size boxes of candies on sale and picked a few us and using Patter papers I had on hand I wrapped them and added some ribbon from my stash. I die cut a tag from a piece of coordinating card stock and I stamped the little snowflake images from the Christmas Critters set from Right at Home onto it. Then I stamped and Head embossed the sentiment from the Holiday sentiment set. I attached the tag with some dimensional adhesive. I stamped the gingerbread images from the same Critters set and colored it in with Copics then I fussy cut it out and added some Wink of Stella for a bit of sparkle and some fun goggly eyes. For some more Bling I added a few Sparkling Clear sequins from Pretty Pink Posh. 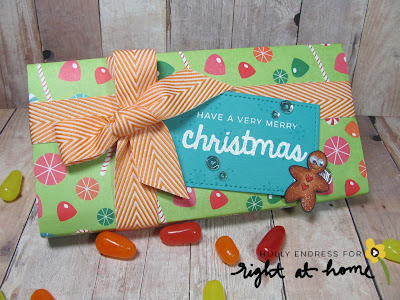 Head over to the Right at Home blog and see what Nicole as created today.